It was very popular. Remarkably ruthless the SF Encyclopedia found it, and a rich lode of ideas. 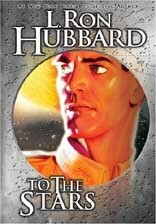 Writers had used Einsteins special relativity theory before in stories, but Hubbard brought to his novel the compressed story telling and pulp skills that had stood him in over a decade of professional writing. There are no indigestible expository lumps, no pages of digressions. The story moves. Or sloppily, either. Hubbard goes the final lap in actually writing out the relativistic equations for the increase of mass and slowing of time as a starship approaches the velocity of light, c. This is almost a talisman now in our field--a signature of a writer who wants to impart to the non-technical reader some of the iconic value of the mathematics, while letting the scientifically savvy know that the game is being played with the net fully up, and indeed, stretched tight. This is an extravagant yarn. It poses characters trapped not just by the confines of their ship, but by the very laws of the cosmos. To voyage to high velocities, approaching light, is to strip us of our moorings in the past. Fast travel leaves behind not merely our origins, but our culture. Immigrants often leave their homes knowing that they will probably never see them againan experience very common in the 16th to the 20th century. But to know that those lands and cultures had vanished forever into the dark abyss of lost timethat is a cruelty visited by the laws of physics upon any intelligence, with no reprieve. It is indeed the stuff of high drama. Of course Hubbard was drawn to itnot only in this work, but also in the earlier Beyond All Weapons. A quarter century later, Joe Haldeman worked further through the basic ideas in The Forever War. For time is the most twisted idea in modern physics, with many nooks and crannies for a novelist. I wrote my novel Timescape about the implications of both special relativity and the more profound general relativity, on our basic understanding of time. There is plenty yet to do, too. A useful popular guide to this weird conceptual landscape is Richard Gotts Time Travel in Einsteins Universemore than enough to wrench the mind around. and the stars. I have spent a lot of my professional life as a physics professor trying to work around the consequences of Einsteins special theory of relativity. Over the last few years Ive worked on both theory and experiment for ways to approach the relativistic realm. It seems that, unless you want to spend the budget of a major nation on a huge fuel-burning starship, you must ask for help. Rather than Hubbards thundering spaceships, perhaps the next stage in our reach toward the stars will come from gossamer craft, driven by the weightless authority of light itself. With others, Ive worked out ways that sails of thin fabrics could dive close to the sun, picking up big velocities by skirting close to the stellar fire. The increased sunlight there could propel such advanced sail craftmade of nearly pure carbon fibers, to survive the heatto very high speeds. It is within the realm of chemical rockets to give us speeds of 10 kilometers/second. Advanced nuclear can approach 100 kilometers/second. But a sundiver could perhaps attain 1000 kilometers/second. This seems pretty puny compared with light, which moves at 300,000 kilometers/second without breaking a sweat. But its a beginning. If mankind ever reaches the stars, it will voyage on vessels we probably cannot imagine, using technologies we cannot glimpse. But those who go will be human. They will feel the pain and joy we ourselves know. To the Stars shows us what that could be like. The physics gives it backbone, but the drama gives it heart. For more reviews or to buy To The Stars from Amazon.com, click here.